NASA's Mars Exploration Rover Spirit has found a patch of bright-toned soil so rich in silica that scientists propose water must have been involved in concentrating it. 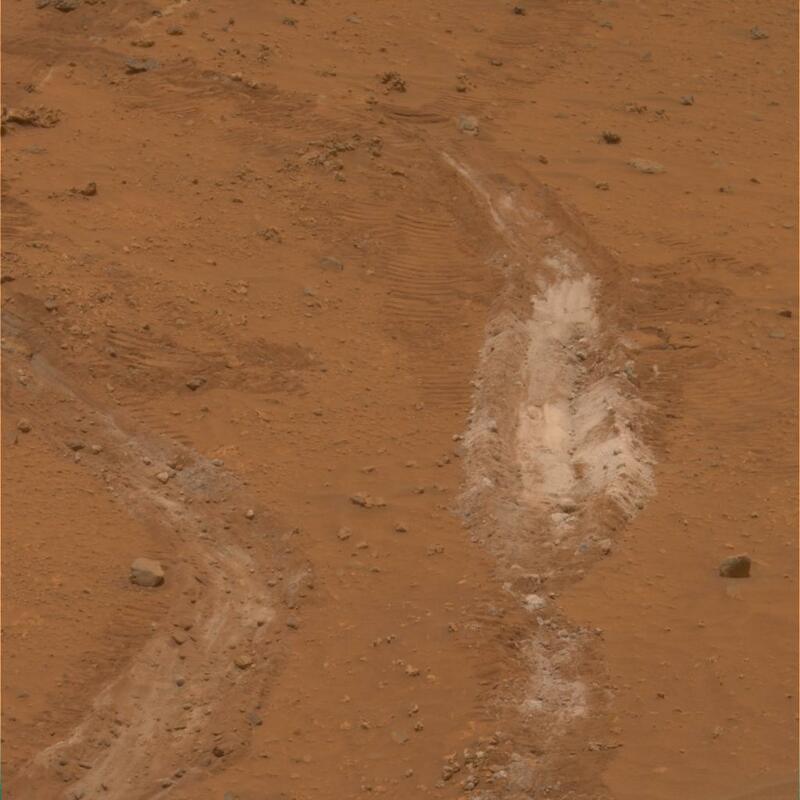 The silica-rich patch, informally named "Gertrude Weise" after a player in the All-American Girls Professional Baseball League, was exposed when Spirit drove over it during the 1,150th Martian day, or sol, of Spirit's Mars surface mission (March 29, 2007). One of Spirit's six wheels no longer rotates, so it leaves a deep track as it drags through soil. Most patches of disturbed, bright soil that Spirit had investigated previously are rich in sulfur, but this one has very little sulfur and is about 90 percent silica. This image is a approximately true-color composite of three images taken through different filters by Spirit's panoramic camera on Sol 1,187 (May 6). The track of disturbed soil is roughly 20 centimeters (8 inches) wide. Spirit's miniature thermal emission spectrometer, which can assess a target's mineral composition from a distance, examined the Gertrude Weise patch on Sol 1,172 (April 20). The indications it found for silica in the overturned soil prompted a decision to drive Spirit close enough to touch the soil with the alpha particle X-ray spectrometer, a chemical analyzer at the end of Spirit's robotic arm. The alpha particle X-ray spectrometer collected data about this target on sols 1,189 and 1,190 (May 8 and May 9) and produced the finding of approximately 90 percent silica. Silica is silicon dioxide. On Earth, it commonly occurs as the crystalline mineral quartz and is the main ingredient in window glass. The Martian silica at Gertrude Weise is non-crystalline, with no detectable quartz. In most cases, water is required to produce such a concentrated deposit of silica, according to members of the rover science team. One possible origin for the silica could have been interaction of soil with acidic steam produced by volcanic activity. Another could have been from water in a hot spring environment.